Prime Minister of Belize, Hon. Dean Barrow announces in his ongoing press conference this afternoon in Belize City, that the Government of Belize has allocated $4.4 million dollars to commence road works on the Philip Goldson Highway from the beginning of Social Security Building in Corozal Town right up to the Santa Rita Hill being "concreted". In addition, Prime Minister Barrow stated that he has asked the Mayor of Corozal Town to identify additional streets, starting with two that government will also pay for. PM Barrow further stated that this is on top of the five (5) streets that the Mayor already contracted with Imer Hernadez to do, two (2) of which have been completed which the government has paid for. PM Barrow announced that work in Corozal will begin on Monday. 1.5 million was spent on the street in front of the Police Station and market. It was full of potholes within 2 months of completion. This will just be more wasted or pocketed money for the corrupt Mayor and Corozal Town Council. Been There & Done That and glad to be out. In June of this year, we told you about the major road repair project that kicked off in Corozal Town. As we reported, Central Government had allotted 4.4 million dollars to “concrete” one mile of the Philip Goldson Highway in Corozal starting from in front of the Social Security building right up to Santa Rita Hill. The good news tonight is that a portion of the road has been completed and was open to vehicular traffic for over a week. We spoke to the foreman of the project who told us that the project is half way complete and has employed over 100 men who have been working around the clock for the past four months. 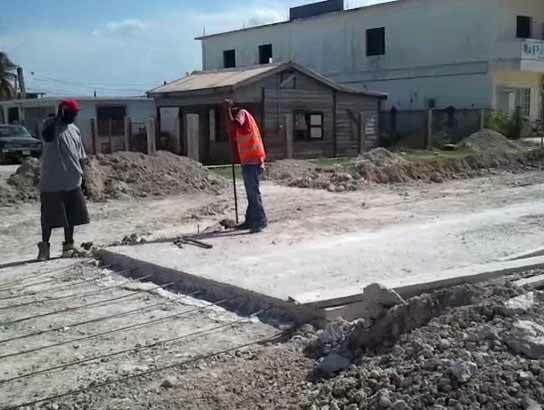 And if you happen to live in Corozal or driving through, you might have noticed that the road that is now being cemented is almost by the Corozal bus Terminal. Today reporter Victor Castillo visited the area and spoke with one of the supervisors, who informed us that approximately 45 % of the project has seen progress. With 55 % of the project remaining, it is said that the project should see its completion by early March of 2015.